Causes produce effects and often in science we find that some underlying cause produces effects that form of a pattern. At the beach in Summer, we frequently find a refreshing breeze blows in off the ocean. This is a pattern. Why does it occur? The sun heats the land causing air to become less dense. Less dense air rises. As the air rises, it draws cool ocean air inward to replace it. We see this pattern day after day. This example highlights another important aspect of cause and effect relationships. Proving cause-and-effect takes careful scientific work, and there needs to be some mechanism or chain of interactions that connect the cause to the effect. Re-read the previous example. How many linked events are there leading from the sun to the breeze off the sea? Are they logically linked? Scientists collect evidence and build models to demonstrate and test ideas like these. Can you reconstruct a chain of events that produces a sea breeze? Meteorologists study the forces that affect hurricanes to make predictions about where they will go next. Many different factors affect the weather. The relationships are so complicated that meteorologists build computer models to help make predictions - which tell us the chance of rain on Tuesday. Just because two sets of data are correlated, does not mean one causes the other. 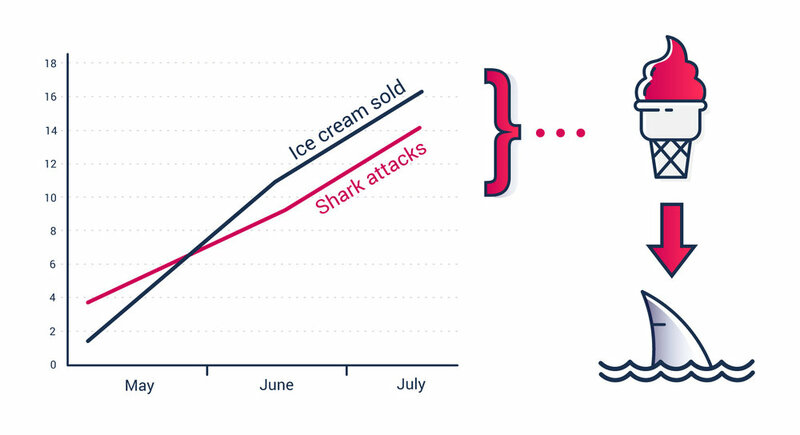 Shark attacks and ice cream sales both rise int he summer, but one does not cause the other. Is there a third underlying cause?